All proceeds to support the LT Michael P. Murphy Navy SEAL Museum and Naval Sea Cadet training facility. 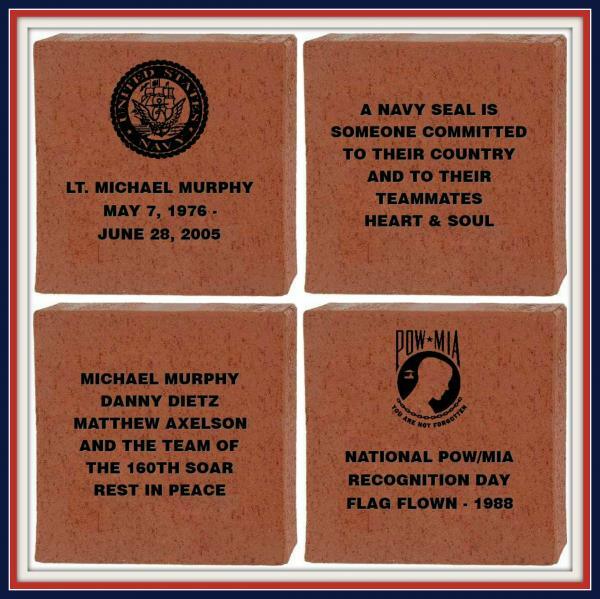 To help fund the LT Michael P. Murphy Navy SEAL Museum and Sea Cadet Training Facility being built in 2018, we are offering the opportunity to purchase commemorative bricks that will be located on the grounds of the museum, connecting our external exhibits and bringing people to the main museum entrance. Not only will you know you were an integral part of completing this project, but you can leave a legacy of remembrance. The brick can be inscribed with your name, a dedication to those you love, or those that have fallen in service to our great country. Your dedication will lead directly up to the beautiful museum entrance, creating an everlasting memory that will live on for generations to come. Each brick will be laser inscribed with your design, ensuring that it lasts a lifetime without worrying about fading or degradation. Click on the customization button to be directed to the ‘That’s My Brick’ website, where you can customize your design, preview the layout, and pay for the brick. The brick placements will be laid out during the final phases of construction, after which your brick will be delivered and installed into one of the pathways or exhibit transitions around the museum. Because the bricks are being engraved using Laser Processing, they can be not only customized with text, but also with images. The laser marking process produces a fused glass layer of black on the surface of the brick. There are a list of approved images to choose from located here. You can place your order today online. Click the button below and go to the ordering website where you can pick your design and place your order. Your brick will be available for viewing after the museum opens. If you would rather mail in your order, download this form below to walk you through the process. Contact us if you have any questions. When will I get to see my brick? We are as excited as you are, but we do have a little time before your brick gets to its final destination. Your brick is part of the new museum walkway. With construction of the museum happening late 2018 to early 2019 the walkway is one of the final pieces to come together. We will be sure to let everybody know when the brick schedule get closer. Where will my brick go in the walkways? The order of the bricks is being designed by the creative team and landscape architects as the walkway comes together. We plan to have some keystone bricks that mark impactful moments Navy SEAL history which will be useful for guiding and remembering where your brick is. Can I use my own logo? Yes! We can customize the brick anyway you want. We do need to approve your logo and make sure that we have the legalities in place for us to be able to use it. Check the ordering page for the approval form and instructions on how to make that happen. 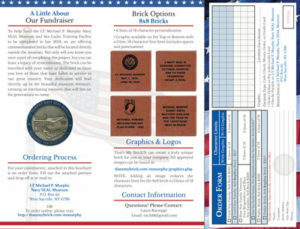 LT Michael P. Murphy Navy SEAL Museum is a 501(c)(3) tax exempt, national non profit charitable foundation.